Check out the top wedding planning apps for iOS, the best FREE iPhone and ipad apps for loving couples who are planning their marriage. Plan your wedding from your favorite gadget. How about make your life easier and avoid the stress of your wedding preparations. The problem is that there are so many items to plan that ends up being easy to get lost amid the avalanche of tasks. In that case, how about the help of technology to get the job? Check out these six apps below that can help you plan your dream wedding. So you do not freak out between folders and endless clippings from choosing color schemes, flowers, and invitations to arrange your seating chart. The applications below will help you manage your entire wedding party without neurotic. Go and check it out! Organizing a wedding where the bride and groom leave their hair out, but with the WeddingHappy this task can be a little easier. The application provides a countdown of the days until the wedding that allows you to organize all the tasks that must be performed until the big date. Sending invitations, reminders of tasks to employees, choose the dress, contacts books and pecks of conquest every progress in the activities listed and the app WeddingHappy remind you the right time for everything. If you are lost with the list of things to do, this application can be very useful. iWedPlanner – The Wedding Planner is just another great app like WeddingHappy if you want to organize and plan your wedding. You get hints of any upcoming event, you never forget to make the payment or assembly because the reminder will come to you from your phone. You will find information on everything you need to plan your wedding. 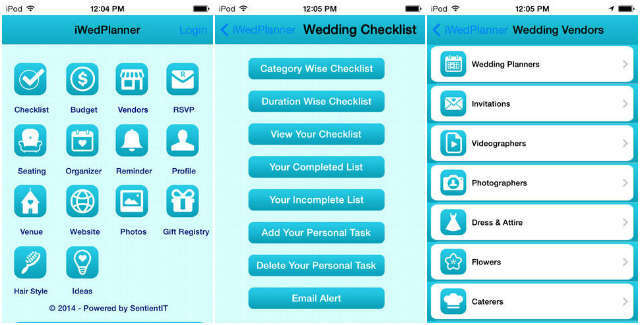 iwedplanner app has all the tools you need to plan your wedding. iWedPlanner is a comprehensive program of planning a wedding so that you can start planning your wedding and be happy with your results. Appy Couple is an app that functions as an official wedding guide for your guests. Facilitates a bit for your guests as they have all the information of your wedding at hand, and who has no smartphone nowadays? You can even access all the same from a PC! You can update all useful information for your guests (events, timetables, directions to get the different places, links to your wish list,…) and you can also tell your story, countdown to the big day, games, send messages and a full gallery where you and your guests can upload photos. Plan every detail of your wedding with the app The Knot Wedding Planner. The app provides several useful tools that allow you to organize the guest list, specify the tasks, see models of dresses, choose the hairstyle, put budgets in spreadsheets and more. 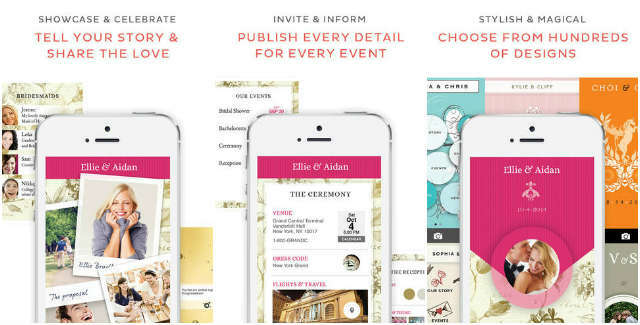 Planning a wedding from scratch can be tricky for those who never made anything, but The Knot Ultimate Wedding Planner app makes everything simpler. If you are in search of the wedding dress, the app Vera Wang on Weddings promises to be a great source of inspiration for your big day. 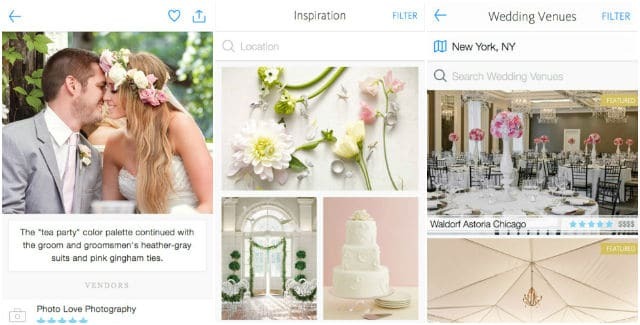 The app features over 1000 photos, with the ability to create murals of inspiration to choose the colors and style of your ceremony, and watch the parades of the brand. 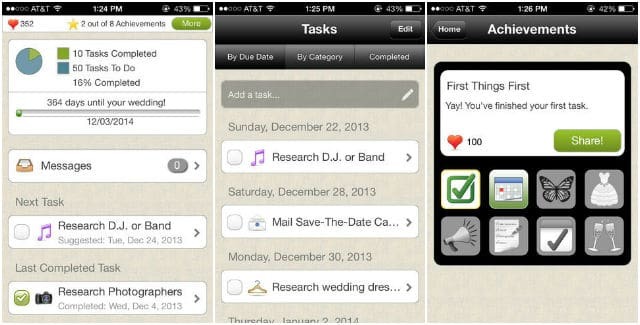 The app also includes task management, guest list, gifts and suppliers. So, how is the desire to plan your wedding party? 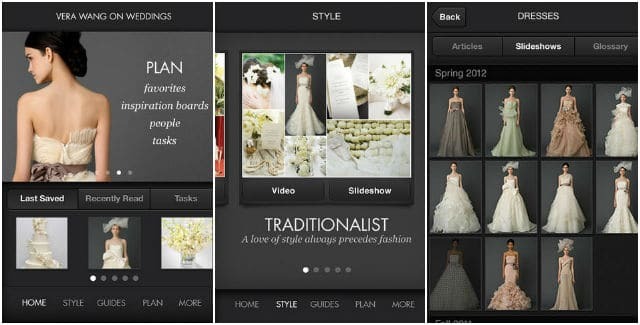 Do you know any nice app to get organized for your wedding? Suggestions are always welcome, place it below in the comments with the name of the app you use and a small description of it, thus contributed more options. If you liked this article please do share it with your friends on social networks, they will love it!